I cannot resist sharing this recipe. It’s a dish based on my love of American food, which was stoked by many early mornings watching Man v. Food to keep myself awake as I cuddled my newborn son. Although the challenges were sometimes a bit grotesque in the programme, the places, ingredients, regional differences and cooking techniques have stuck in my mind. For this recipe, I don’t have a smoker big enough to fit brisket in. Nor can I slow-cook a whole pig for 24 hours over hickory chips, much as I’d like to. 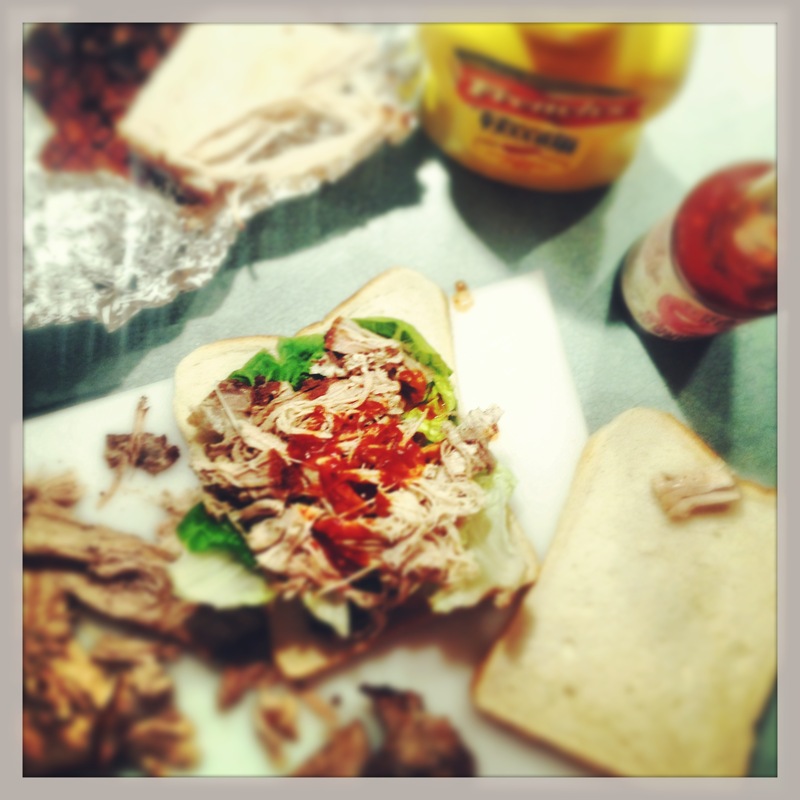 So I’ve taken the best bits of my Geordie granny’s ‘pork with crackling’ recipe, spiced it up a little and mixed it with some of my hazy Man v. Food memories – and made myself a very delicious sandwich. It’s not something you can quickly knock up, but get everything ready the day before and you will have a week’s worth of joy and a lifetime’s worth of requests for your famous pork sandwich. Lightly toast the spices in a dry sauté pan and grind to a powder with a pinch of salt. Score the skin of the pork and pour boiling water all over it. This will help dry it out. Pat dry with kitchen towel and rub in the spice mix, then leave uncovered in the fridge overnight. Chop the onion, leek and carrots. Put them in a roasting tray, then put a rack over them and the pork on that. Cook for 25 minutes, then turn the heat down to 130°C and cook for a further two and a half hours. Check the skin is crisp. If not, turn up the heat to 220°C and cook for a further 10-15 minutes. Leave the pork to rest a while, then tear apart and serve in bread with spring onion, lettuce, mustard and smoky chilli sauce.